On 11 February, my little sister Sarah suffered a stroke. It was completely unexpected– she is relatively young & extremely health-conscious, with no obvious risk factors. But the stroke was massive & for a time she was very close to death, in intensive care with many complications adding to our worries. I’m very thankful to the doctors & everyone else at Duke for seeing her through this perilous time, & for all the support from family & friends. I’ve been spending many nights in the hospital, & have seen first-hand the hard work of all the doctors, nurses & therapists that collaborate to care for someone in this condition. And I see how Sarah draws strength from the flood of cards & messages from her students & fellow teachers, her friends in the environmental education movement, & the many, many others who care about her. Sarah is an amazing person, & in some ways also very lucky. Though her left side is still entirely immobile, & for weeks she was unable to talk, she was able to sign the word “stroke” on her first day after the operation (one of her many linguistic skills is ASL), & she could also write much sooner than the doctors had expected. Better still, it was clear that not only had she retained her ability to think & communicate, but also her personality, which is full of humor & a strong streak of mischief, along with great curiosity & caring about the world. One night I was with Sarah, helping her do some guided meditation to cope with pain. Sarah had traveled to India last summer, a life-changing voyage in many ways, & Hindu imagery was particularly fresh in her mind. 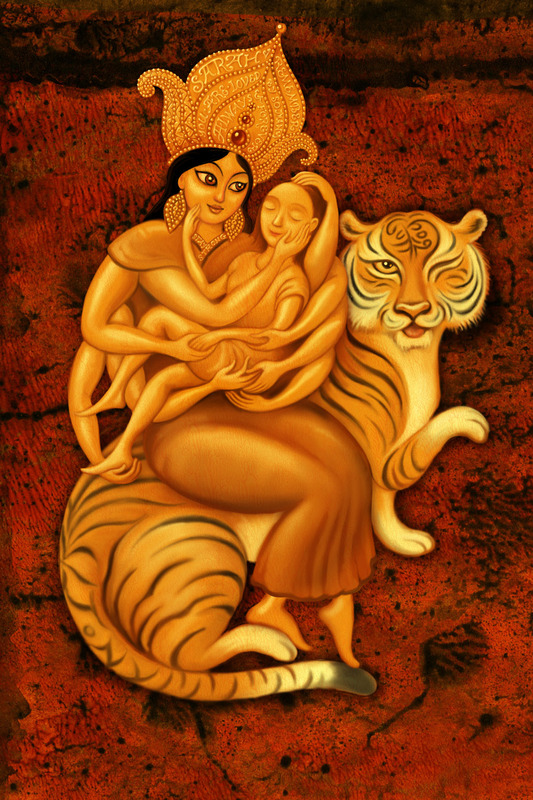 She wrote on her clipboard that she envisioned the goddess Durga cradling & supporting her with her many arms, & asked if I would draw her a picture to help her focus on that image. For weeks I had been so consumed with worry & care for Sarah that I was unable to bring myself to draw or paint– I had tried sketching once or twice, but my heart just wasn’t in it. But having that “assignment” motivated me to make art again, & I must say, it felt good! Sarah moved from the hospital to acute rehab this week, & of course this picture is decorating the wall of her new room. She’s able to talk now, to joke with everybody, even to sing a little! Yesterday she stood (with assistance) for the first time. It’s going to be a long & arduous journey back to health, but I’m certain that, just as after her voyage to India, she will come back full of new insights & energy. This entry was posted in Illustration, Uncategorized and tagged Digital, Durga, Goddess, Photoshop, Sarah, Stroke on 13March 2014 by Leah. So sorry to hear about your sister. This is a lovely image and it is sure to have healing power. Stay strong and creative. Thanks so much, Donna! Sarah inspires me to stay strong. I am saddened to hear that your sister suffered a stroke. My brother had a massive stroke 4 years ago and I know how hard they have to fight back. Knowing that you and family are there is truly a blessing. Your painting of Durga’s Embrace is awesomely beautiful (as your work always is) and I know that it will bring healing and happiness to Sarah for a long time to come. Please know that I am praying for you, your sister and your family; for strength and for compassion. Valarie Jean, I didn’t know about your brother’s stroke– I’m so sorry to hear of it, but I hope he is doing better now. Thank you so much for your prayers & your sweet words. Thank you for sharing this, Leah, for many reasons. First, so that so many more of us who are strong right now can send her (and you) strength and energy, if you will; for the beautiful art; and also for demonstrating what people born with the hand-eye connection are, and have always been, here for. That image contributes so much to understanding on levels other than medical, and to healing. It is profound, as art should be. Laurie, I so appreciate your message. Sarah was the one who actually created this vision– her mind is still so agile & inventive, despite the huge injury to her brain. It was a healing experience for me to draw this. I’m so sorry your sister had this happen to her. Sending her a prayer and best wishes for her recovery. Thank you, Valerie, we appreciate your positive thoughts.